We’ve tried to gather together some useful information that doesn’t really fit in any of the descriptions of what we did to the van. Some is stuff we learned by reading the Sprinter Forum. Other things we had to find out the hard way. Join the Sprinter Source forum. Lots of experienced people will answer your questions, but make sure you search for an answer first. The forum software is old and kind of clunky, but it’s a wonderful resource. 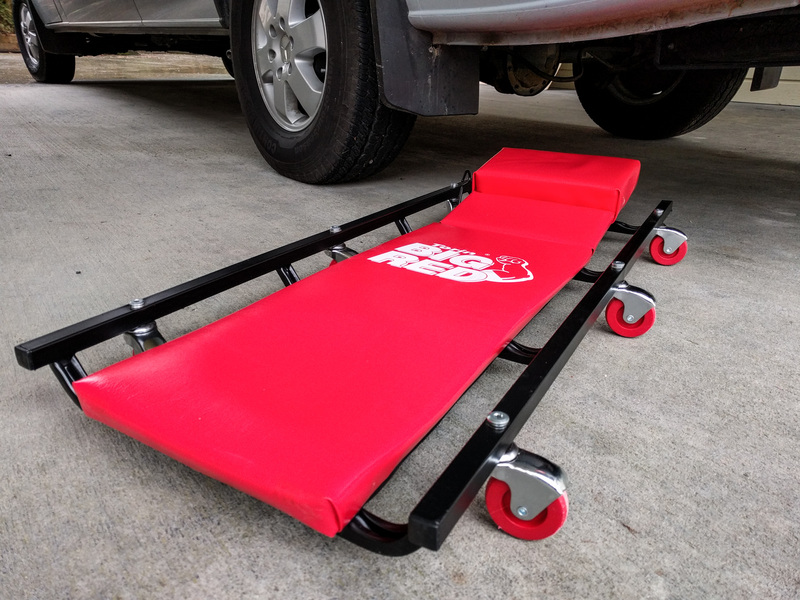 Check out OutsideVan, RB Components, Van Specialties, and maybe even Sportsmobile (although their interiors are kind of old school) for ideas. Most of these upfitters also sell the parts they use in their conversions. Not always the cheapest price, though! There’s also a Sportsmobile Forum area just for Sportsmobile Sprinter owners.
. Seriously. We got over 80% of the components for this build from Amazon, mostly delivered in 2 days. In fact, we felt guilty when the local USPS mail man had to come out on Sundays to deliver things. There’s an irony that USPS won’t deliver mail on Sundays, but the same people will deliver Amazon’s packages. Some items weren’t available on Amazon. Some were slightly more expensive to buy through Amazon, but mostly they were the best option overall. Measure twice, cut once. You will end up with a stack of cardboard from all the Amazon boxes. Use it to visualize how things will fit together. We made several changes based on how things looked physically. It’s good to get a real understanding of the size of the things you’ll be adding to the van. You can get by without any of these tools, but they really make life easier and in our estimation they’re worth the initial outlay. Trim removal tools are plastic levers that you can work between the door panels and the metal, or between the headliner and the ceiling, to pop the plastic fixings out without breaking them. Cheap and super-useful. Rivnuts let you add a threaded fastener anywhere you want in the van’s sheet metal. A proper rivnut tool makes setting rivnuts into the walls much easier than the cheap use-two-wrenches style tools. We bought the Astro Pneumatic 1442 tool. It’s manual, not air based. Pneumatic is just the name of the company. Volt/Ohm meter. 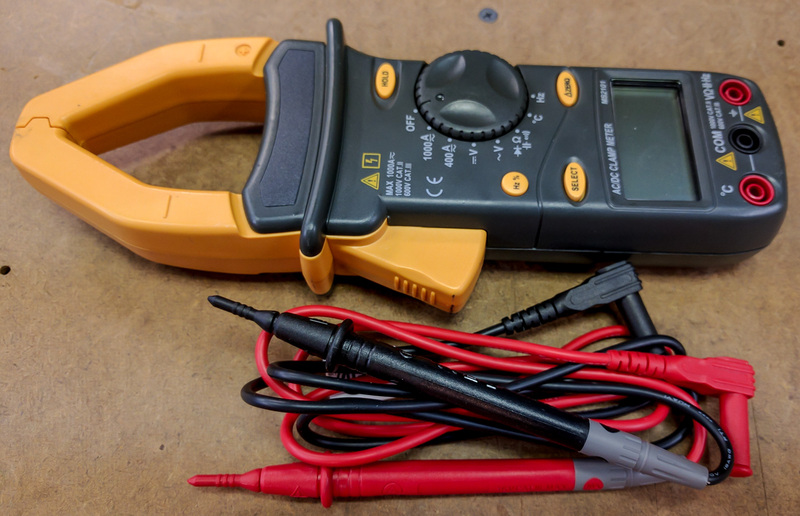 You’ll need to measure voltages and current, and check wires for continuity (make sure the wire goes from A to B without a cut, break, or loose connection). A good multimeter does all this for you. We already had a basic $15 meter which is OK for most things, but the clamp-on meters let you measure current too. We bought the Mastech MS2101 clamp-on meter. Comparatively cheap, and it does the job with enough accuracy for our needs. It comes with a temperature sensor and test probes. You’ll be crimping or soldering a lot of cables. We chose to crimp rather than solder. We already had some linesman’s pliers like these with a built-in “bump” that creates much better crimps in 10-gauge and 16-gauge crimp connector ends than the regular crimping tools. That bump is designed for bare connectors rather than insulated ones, so if you use one be careful not to cut through the insulation with the pressure you apply. 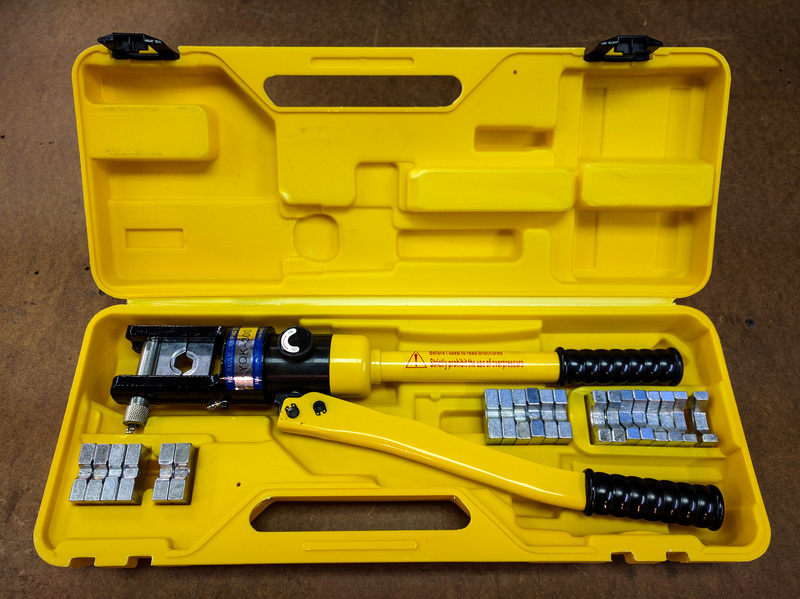 We did buy a hydraulic crimper for the large-gauge cables we used. If you are using 4/0 gauge, you’ll need the 16 ton hydraulic crimper. If you’re only going up to 0/0 gauge, you can use the smaller 10 ton hydraulic crimper. Both of these come with interchangeable crimp head dies. The dies are metric, so you need a conversion chart (PDF) to know which is the equivalent AWG gauge. Actually, just placing them round the crimp lug will let you know which is the most appropriate one to use. Check around on Amazon – the price of these hydraulic crimpers varies from week to week in my experience. We paid ~$45 for the 16 ton one. Here are some tips on how to crimp cables properly. You’ll also be cutting thick copper cable. It’s not easy to get a clean straight end if you’re gnawing away at the cable with pliers or something. Do yourself a favor and buy a ratcheting cable cutter. It will save you time and make your crimp joints better because you’ll have a clean cable end to insert into the cable lug. Of course once you’ve cut your cable, you need to strip the insulation. For anything from 20 to 10 gauge, we used a Klein 11055 wire stripper. Much easier than using a knife or your teeth! If you do use a knife, be careful not to score the copper cable inside the insulation. The Klein 1010 is a combination wire stripper and crimper. There are lots of holes to drill in the interior van walls. If you push too hard, you run the risk of denting the exterior skin as you break through the hole. Don’t do that. Instead, buy some drill stops or just cut a length of PVC pipe to slide over your drill bit. Clean the holes you drill – especially if you’ll be inserting Rivnuts – with a deburring tool. If there’s swarf left in the hole, the rivnut won’t clamp down properly and may spin later, which is a real pain. Instead, turn this tool around a couple of times in the hole and all the rough bits magically fall away! You’ll be spending time under the van. Especially with the 4×4 there’s enough room to slide around under the whole vehicle on a creeper. The one we bought has mixed reviews on Amazon. We’re happy with it for the level of use we put it to. We did zip tie the adjustable headrest in place to stop it flapping around each time we pick the creeper up. Coverking sun shade for the windscreen. Cheaper than you could make out of Low-E insulation and better looking. Grab handle for the rear doors – especially helpful to climb in to a 4×4. These handles won’t work with a platform bed that extends into the D-pillar area. We ended up using webbing straps instead. Either type of handle is sturdy. Grab handle for the sliding door – this takes some work, because the threaded holes aren’t there like in the rear. However, it’s a great addition, especially on the 4×4. Half-way stop for the sliding door. Make it stop when it’s only half way open so you retain some privacy and heat inside the van. You can get these from Mercedes, but in my opinion the aftermarket one is better.